Make her fall for you all over again with a one of a kind look from Apples of Gold. This expertly designed 14K white gold ring boasts fine edging that sets the stage for a whimsical display of craftsmanship. A brilliant white diamond is set inside a solid white gold heart and is embraced by two sweeping branches of fine filigree. To complete this beautiful look, dual flowers in perfect bloom evoke the feeling of romance. Weighs 9.5-11.5 grams (depending on size). 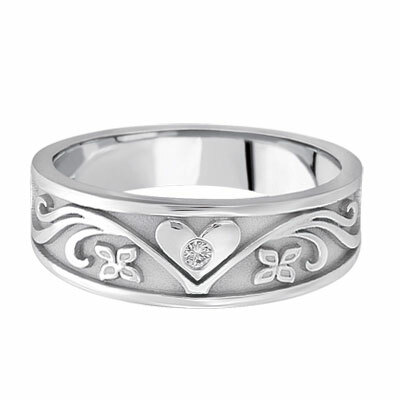 We guarantee our Floral Heart Diamond Wedding Band in 14K White Gold to be high quality, authentic jewelry, as described above.